Andreas Ventsel defended his Ph.D. thesis on semiotic theory of hegemony at Tartu University, Department of Semiotics in 2009. Currently, he is working in the same institution as a senior researcher. 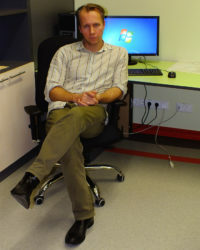 He has been a visiting researcher at Tbilisi Ivane Javakhishvili State University, Georgia, and has given lectures at the University of Turin, Italy, as well as at most of the universities in Estonia. He has lectured about theories of culture, semiotics of culture, semiotics of online communication, discourse theories, political semiotics, etc. His main research interests are related to political semiotics, cultural semiotics, online communication, and power relation research. Some of the projects he completed are: ETF7988 “The Power of the Nomination in the Society and in the Culture” (01.01.2009−31.12.2013), SF0180056s12 “Semiotic Modeling of Self-Description Mechanisms” 0(1.01.2012−31.12.2012), ETF8804 “Semiotic Perspectives on the Analysis of the Power Relations and Political Communication” (01.01.2011−31.12.2012). Ongoing projects are PHVFI16937 “Semiotic Analysis of Discourses of e-Estonia” (01.04.2016–open) where he is a principal investigator. He also is part of the research staff of IUT2-44 “Semiotic Modeling of Self-Description Mechanisms: Theory and Applications” (01.01.2013–31.12.2018). (with Ott Puumeister) “Biopolitics Meets Biosemiotics: The Semiotic Threshold(s) of Anti-Aging Interventions,” in Theory, Culture & Society. “Political Potentiality of Conspiracy Theories.” Lexia, vol. 23, no. 24, 2016, pp. 217−34. “Rhetorical Transformation in Estonian Political Discourse During World War II,” in Semiotica: Journal of the International Association for Semiotic Studies.